Were the statements made in commerce? Can the United States follow the example? This is an extremely long decision, and I obviously won’t go over everything. The court analyzed in detail whether the statements were made in trade or commerce, whether they were misleading or deceptive, and other issues. The decision examined three articles that appeared on Homeopathy Plus! Pty Ltd’s website. In short, the articles claimed that the whooping cough (properly known as pertussis) vaccine is short lived, unreliable and ineffective, and not a good tool to protect against whooping cough. They suggested that homeopathic remedies can offer a safe and effective alternative to protect against whooping cough (or complement, if the vaccine was already given). The trial centered on expert evidence. Each side put forward several reports from medical experts. To be allowed as evidence, an expert opinion must be relevant, from a qualified expert, and well explained – it must be explained what it is based on (paragraphs 28-32). The ACCC’s experts met that standard; Homeopathy Plus! Pty Ltd’ experts did not, with two exceptions. I want to address three other issues (the court addressed others). As highlighted by M. Warne Hadley, an experienced and expert Australian Barrister and Solicitor, in none of them did the court break new legal ground – all involved application of existing principles to the facts of the case. Among other things, that means that an appeal against the decision – which is at any rate detailed, careful and well reasoned – has very low chances of success. Australia allows more appeals on matters of fact than the United States, but it’s still a challenging appeal. Ms. Sheffield claimed that her statements were part of her advocacy efforts, efforts to engage in a public debate about prevention of whooping cough and to promote homeopathy. Although the court acknowledged her sincere devotion to advocacy promoting homeopathy, it rejected the claim: the articles in question had a link to the store nearby; at least one of the products recommended for prevention of whooping cough was sold by Homeopathy Plus! Pty Ltd; and one of the activities of Homeopathy Plus! Pty Ltd is selling homeopathic remedies. [infobox icon=”quote-left”]Not only is protection from the current vaccine short-lived and unreliable, but side-effects are common. The decision examined the evidence, and concluded that the claims are misleading and incorrect. First, excellent evidence supports high effectiveness for the vaccine. A Cochrane review places such effectiveness at 84-85% at preventing classic whooping cough and 71-78% at preventing mild disease (paragraph 171). Expert testimony supported this evidence. This evidence is also accepted by the Australian Immunization Handbook, which “is regarded as providing the best advice to Australian doctors on administering vaccines against vaccine preventable diseases including whooping cough.” (paragraph 189), and by the Centers for Disease Control and Prevention. The decision also reminded us that even though the vaccine is not 100% effective, herd immunity offers an extra layer of protection. In other words, as there are less unvaccinated individuals, we have less cases; but since we have more people who are vaccinated, similar rates of infections in them result in higher numbers of cases: 5% of 950 is larger than 5% of 500. Similarly, similar rates among the shrinking population of unvaccinated individuals lead to smaller numbers: 50% of 1000 is more than 50% of 100. So the larger number of cases that are vaccinated does not show the vaccine is ineffective. 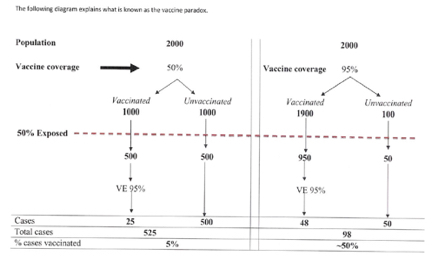 The right comparison is the rates of infection among the unvaccinated (in the example, 50%) v. the rate of infection among the vaccinated (in the example, 5%). And indeed, studies show that the unvaccinated have much higher rates. Finally, while the court acknowledged that immunity from the vaccine waned, it concluded that describing the vaccine as short lived is misleading since it ignores the schedule of boosters designed to prevent harms from waning immunity. In short, the court found the articles’ description of the whooping cough vaccine to be misleading. The ACCC’s experts conducted several data base searches. In spite of that, they were unable to find scientific articles meeting the required evidentiary standard that supported the claim that homeopathy generally – or the remedies suggested by the articles – are effective or safe in preventing whooping cough. The court also emphasized that both the Australian Medical Association and homeopathic associations – the Australian Register of Homeopaths and the British Homeopathic Association – acknowledge the lack of evidence for homeopathic treatments in this context and do not recommend it as an alternative to immunization. In short, the statements about the use of homeopathy to prevent whooping cough were also misleading. The court highlighted the danger whooping cough poses, and the potential risk from promoting an alternative without evidence behind it to tested and proven vaccines. Such misleading statements could literally have a cost in life and health. (paragraph 247). The court found that respondent engaged in misleading conduct in trade or commerce. It so declared, and left discussion of penalties the ACCC sought for future hearings. The Australian Federal Court recently ruled that Homeopathy Plus would be fined $115,000 and its proprietor Fran Sheffield would also be fined $23,000, (plus court costs). The rulings effectively prevent these homeopaths from continuing their unethical and unscientific promotion of homeopathy for preventing pertussis, while also blocking their unproven claims about the pertussis vaccine. [infobox icon=”quote-left”]Considering the danger to the public, including our most vulnerable, we find the penalties rather light. A prohibition against such behaviour is welcome, but we question why it was not made permanent, rather than for 5 years, and applied to all advice promoting homeopathy. We are disappointed with the time this case has taken and that that the retraction asked for by both the CRP and the TGA failed to materialise. A published retraction of misinformation is crucial to balance biased misinformation with mainstream medical opinion. But it’s a step in the right direction, and it will serve a precedent in dealing with other junk medicine promoters. As mentioned above, this decision does not break new legal ground in Australia. But by applying it in this context it offers new avenues to those seeking to curtail misrepresentations by providers of alternative treatments. It did so using consumer protection laws. Can the United States do the same? The starting point is that the United States also has consumer protection laws. Congress empowered the Federal Trade Commission (FTC) to act against misleading commercial acts (15 U.S.C §45 prohibits ‘‘unfair or deceptive acts or practices in or affecting commerce.’’). Each state also has its own parallel act (see Kathleen Morris, Expanding Local Enforcement of State and Federal Consumer Protection Laws, 40 Fordham Urb. L.J. 1903 (2013)). The details of such acts vary, but each allows the state to act against misleading claims in trade or commerce. Some also allow action against non-profits. Such, for example, is the case in California – see People ex rel. Dep’t of Motor Vehicles v. Cars 4 Causes, 139 Cal. App. 4th 1006 (2006) and Committee to Defend Reprod. Rights v. A Free Pregnancy Ctr., 229 Cal. App. 3d 633 (1991). States act allow a range of government actors, including the state’s Attorney General and potentially other actors, to use those acts. They often also include a private cause of action. Finally, The Food and Drug Administration (FDA) has the authority to act against misleading claims about drugs. In a memorandum of understanding, FTC and FDA agreed that with the exception of prescription drugs, FTC will have primary enforcement against misleading claims about drugs. The FDA has primary authority over false prescription drug advertising or misbranding. My reading of this is that similar claims to the ones brought by ACCC will have to be brought either by FTC (vaccines are used nationally, and if an organization publishes on the internet, it’s also acting in interstate commerce) or by a state actor under state law. That is because the claims are not misbranding of a prescription drug, but instead misrepresentations of another kind. On the other hand, if a claim was made that a homeopathic remedy could prevent an illness, that could also be seen as false advertising of a medical product, and under the FDA’s jurisdiction. Are there limits? Well, there is at least an argument that if part of the goal of the articles is to advance a public debate, free speech creates a barrier to action. In the United States, a stronger connection than just a link elsewhere on the page to a store might be needed to overcome it – some more direct promotion of the product. It is not however clear that free speech would interfere, and I suggested otherwise, following Amanda Naprawa’s analysis. Consumer protection laws are not new, and have been used in the past against misleading claims, especially commercial claims, but as the California cases above mention, not only. The most important barrier, therefore, is the need for political will to act against these providers. The issue has to be important enough either for the FTC or a state agency to take action. It took the ACCC a long time to take this action; it may take effort and pressure to get regulatory action in the United States to limit misrepresentations by promoters of homeopathic alternatives to vaccines or other promoters of alternative treatments that advocate against vaccination. Maybe pointing to the Australian example will help spur such action. Acknowledgements: I am grateful to Ken McLeod for his help in getting together the information for this post, and to M. Warne Hadley for his incredibly helpful legal insights and comments.